‘Penguin Highway’ Video Captured by 21-Year-Old Traveler | ABC News Blogs – Yahoo! ‘Penguin Highway’ Video Captured by 21-Year-Old Traveler | ABC News Blogs – Yahoo!. 10 dead Borneo pygmy elephants feared poisoned – Yahoo! News. A month later (thanks to Christmas travels, work, and the start of another semester) I am now posting the second piece in my series on unusual animals. This week I am covering the topic of bush babies. These are fascinating little creatures and I took great pleasure in watching them leap through the trees near our campsites the last time I was in Africa. There are two species of bush baby but I will be focusing on the lesser bush baby, Galago senegalensis, as these are the only ones I have had personal experiences with. As the most common species of bush baby, G. senegalensis, can be found in just about all types of wooded habitat especially acacia savanna and miombo woodlands. They can be found in surprisingly dense populations with some areas of acacia savanna in the northern Transvaal having 500 per sq. km. 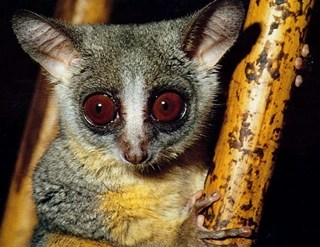 Lesser bush babies often live in distinct family groups. These groups typically consist of an adult male and female plus one or more generations of their offspring. Some of the larger males will actually have several females living in their territory. In this regard their family units are mostly matriarchal. Females that have overlapping ranges will often come together to sleep along with their offspring. Although they sleep in groups lesser bush babies are typically solitary animals. They do not groom each other and forage separately. Most of the diet for G. senegalensis consists of tree gum. On a given night a bush baby may travel up to 2 km leaping to 500 different trees in order to lick up the gum that seeps out of insect holes in trees. Another staple for lesser bush babies are insects.Insects are caught by either leaping and catching them in flight or stalking within grabbing distance. To protect their eyes bush babies will close their eyelids at the moment of capture to prevent the insects from jabbing them with either legs or wings. While captive bush babies are known to drink water it appears that in the wild bush babies live off of metabolic water, that is they get all their water from the digestion of insects and tree gum. What made this species so interesting to me on my last trip to Africa was their locomotion and nocturnal habits. Bush babies are amazingly acrobats. They can leap up to 10 feet or more and have impeccable balance. If they do happen to land awkwardly or in a dangerous spot they can instantly leap again landing perfectly on another branch. Bush babies are also nocturnal which means the best time to view them was once we had returned to camp after the day’s game drive. This provided ample entertainment while enjoying a beer after dinner. Were these a diurnal species I am sure we would have overlooked them. Orcas trapped in ice fighting to survive in northern Quebec.